M is for Miracles, Mystery, Magic, and Merry Christmas! Miracles, mystery, and magic are three of the best words to describe my fantasy short story collection, The Greener Forest. In The Greener Forest miracles are possible. In “Angels,” not only do angels sing in the trees, but pieces of their trunks tell a carver’s hands what to whittle away to free the angel inside the wood. In “Birdling,” a young woman rescues, then cares for a baby bird, but doesn’t know how to teach it to return to the wild. A Brown Man comes to her aid, then “blesses” her with the ability to see and hear the faeryfolk that live in her garden. There are mysteries to be solved in The Greener Forest, too. Why do spriggans skulk about cypress knees, try to sabotage boats, and wreak havoc near the Ferris Wheel in “Tootsie’s Swamp Tours & Amusement Park?” In “Appleheads,” three kids try to figure out what creature is lurking in Miss Greenspun’s garden. And by showing up unannounced in her backyard, they discover her true identity as the moonlight filters through the branches of an ancient tree. Magic abounds in The Greener Forest. When a granddaughter places a bowl of milk next to the pond where her grandfather believed a dragon lived, she begins a magical ritual in “Weathermaker.” And in “Blood of the Swan,” a young man searching for a healer to cure his village of an unknown disease becomes entangled in the magical scheme of a swan maiden. M could stand for mermaid. In “Shoreside,” a ningyo (a kind of Japanese mermaid) who’s married a man and had three children with him, swims into the ocean to save a drowning boy. Once in the waves, the sea begins to call to her, and she must choose between her land-bound family and a life in the water. M could also stand for murder. In “The Garden Shop,” a would-be thief makes the mistake of trying to rob a shopkeeper who not only knows he shot a fellow small business owner, but happens to be a fairy ready to hand out fairy justice. And lastly, M could stand for more. Because these stories and more lead the reader into the depths of The Greener Forest, where Faerie and the everyday world collide. There is dark and light, evil and good, and uncertain dusky gray lurking in between the pages of this book. Discover that all is not what it seems at first glance, and wondrous things still happen in The Greener Forest. And on this most magical, mysterious and miraculous day, M could also stand for: Merry Christmas! 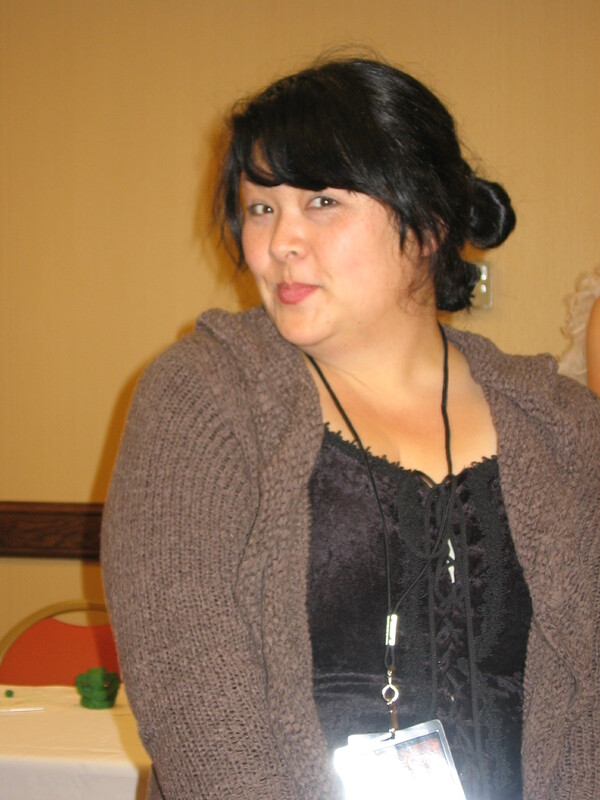 At the recent FaerieCon, I attended a clay sculpting workshop led by the delightful, Patricia Hedegaard. (Shown to the right of text). Ten attendees were each given a lump of clay and 2 black beads. 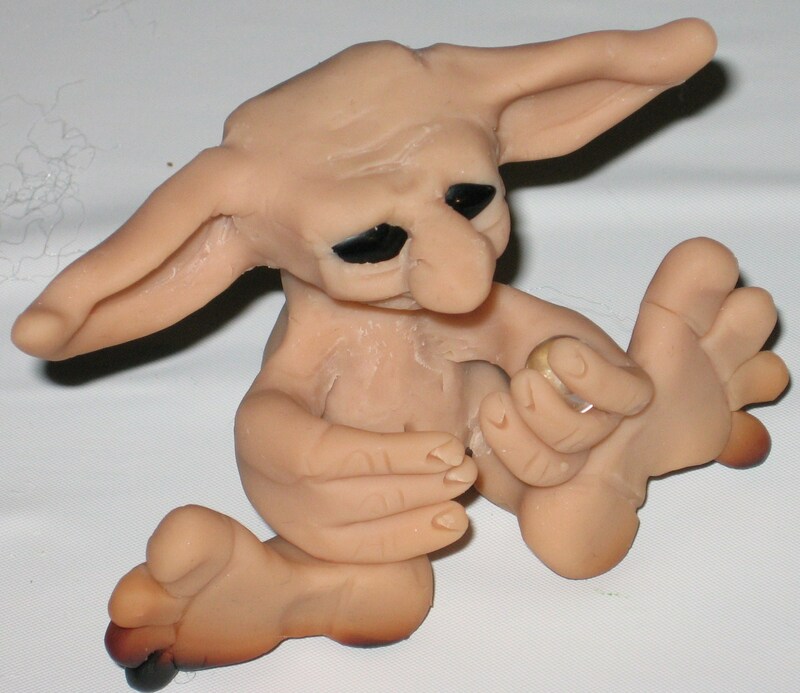 We borrowed Patricia’s ceramic tools, and with her patient instruction — 10 strangely different goblins were born. And though the medium is different (words instead of clay), creating a goblin character for a story is much the same. The writer begins with a heap of words and possible ideas in her head. She begins to separate the words, stringing a few together at a time, and eventually shapes them into sentences. Next, the writer gathers the sentences into paragraphs. She edits her descriptions, reveals the goblin through its actions (rather than telling), double-checks her folklore and legend references for accuracy, and tosses the faery creature into a plot with a few twists and turns. And if the writer is lucky or skilled or a little bit of both — a well-rounded goblin character appears. Whether the nasty, nose-picking spriggans of “Tootsie’s Swamp Tours & Amusement Park” or the mischievous gremlers of “Waiting for More” or the shape-shifting bogle and goblin from “Appleheads,” I had fun creating an assortment of goblins and their kin for my new book, The Greener Forest, due out in March 2011 from Cold Moon Press: http://coldmoonpress.com And I also had fun creating the little goblin to the left. My challenge to you: Take time out of your busy schedule to create something magical whether in words or clay or the medium of your choice. And check out the brand new publishing company – Cold Moon Press. 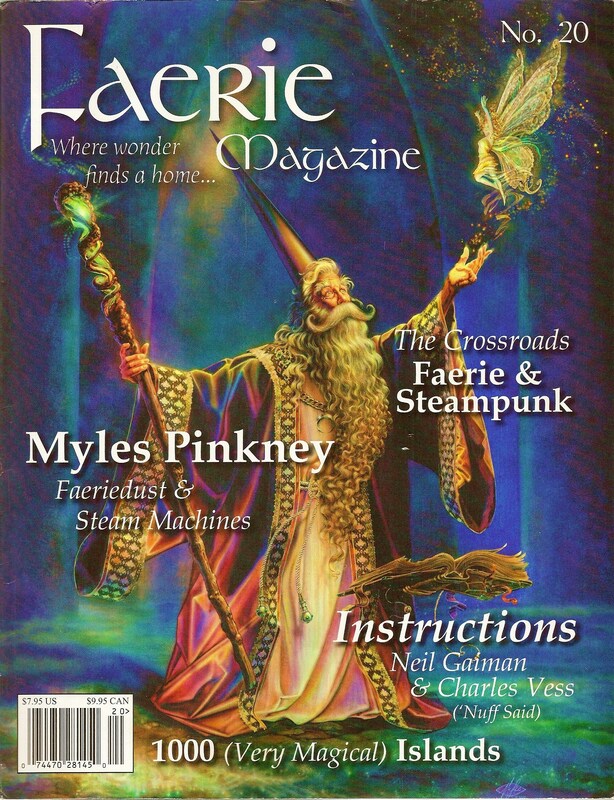 The appearance of my article, “Tussie Mussies – Victorian Talking Bouquest,” in the newest issue “Faerie Magazine” was a thrill for me. But it isn’t the only exciting faery thing happening in my life. At the moment, I’m awaiting the publication of my story, “Tootsie’s Grass River Tours & Amusement Park,” in Sam’s Dot Publishing’s “Sideshow II.” This strange story features a gang of spriggans. And they’re not the smiling, clumsy spriggans of some tales. No. No. My spriggans are growling, spitting, nose-picking fellows with evil in their hearts. As I was writing the story, I asked on Facebook for the input of my friends: “Who should my evil faerieworld race be– goblins or spriggans?” Spriggans won, hands down. Which brings me to a new question, asked here and on Facebook. I’m busy writing several stories for themed anthologies and I want to put some faerieworld creatures in them. I’ve already chosen a Japanese water spirit, a Ningyo, for the protagonist of one tale, but I want to feature another lesser-known faery creatures in each of the other stories. The saying goes: Faeryfolk live in old oaks. And I love faeryfolk. Maybe it’s because I adore oak trees and made tea party place-settings from acorn tops when I was little. Maybe it’s because I wove huge daisy chains and danced every chance I got in mushroom rings. But ever since I was old enough to hold a book, I’ve been fascinated with fairy and folktales and the creatures who populate those stories. And though I adore the butterfly-winged fairies that sail the breezes and ride mouseback to great celebrations in the deepest parts of the forest, I like lesser-known and darker members of Faerie, too. Trolls are one of my favorites. The under-the-bridge troll of The Three Billy Goats Gruff is fearsome indeed, but the trolls of the northern woods of Scandinavia are often viewed as nature-helpers. These trolls are responsible for tending plants and animals. I decided to make the trolls in the fourth tale in my children’s book, Leprechaun Cake & Other Tales, non-threatening. In fact, they’re comical in appearance and quite fond of snow, unicorns, and playing chess. Another one of my faeryfolk favorites are stray-sod pixies. Stray-sods have grass growing from their backs. They settle in a meadow or other grassy spot and wait for the unwary pedestrian to step upon them. As soon as a person steps on its back, a stray-sod twists, turns, and confuses the careless hiker. Stray-sods are one of the faeryfolk I’ve included in a novel-in-progress I’m working on. I’ve included a kelpie in a poem. A kelpie is a waterhorse who waits in moving water for a foolish or curious person. Climb onto a kelpie’s back and you’re likely to be at least dunked if not drowned and eaten. But there’s also something touching about a horse with a shaggy forelock partially hiding its wide set eyes poised at the edge of a stream begging to be petted. Perhaps the kelpie is truly lonely and not just hungry. And what of the swan-maidens of Celtic tales? Healers and were-creatures of great beauty and shyness, I’ve often wondered under what circumstances would they be bold and vengeful. 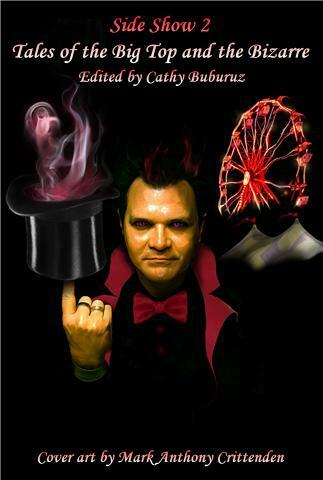 That bit of speculation resulted in my short story, Blood of the Swan, due to appear in a soon-to-be-printed anthology. Even goblins make appearances in my writing. I have several varieties of the much-hated goblin race in my looking-for-a-publisher YA novel, The Enchanted Skean. Though there seems to be little to love about them, the main character, Beck, wonders if the goblins also have names and families. 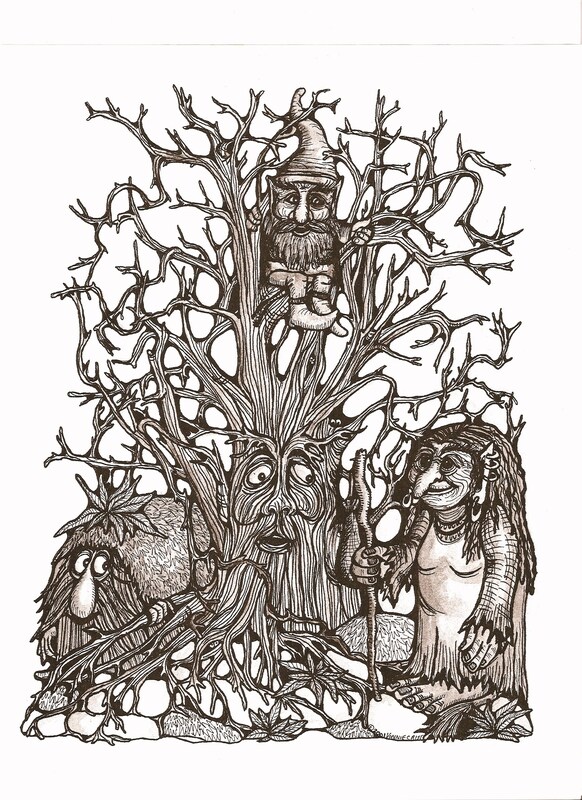 And spriggans, rude and obnoxious cousins of goblinkind, appear in one of my short stories currently “out” awaiting a publisher’s decision to accept or reject. Mermaids are sometimes portrayed as sirens luring men to their death. I played against that type in my eShort, Sideshow by the Sea. Still, I didn’t discard the death-by-merfolk idea all together. Though the protagonist, Dusana, is a sweet girl – the mermen in the story carry knives with sharp, curving blades. So as spring arrives, sit under an oak, read a fairytale, and look for the lesser-known faeryfolk. Perhaps they’re peering at you from behind a shrub, dangling from a branch above your head, or skulking in your cellar way. Just beware, all fairies are tricksy!